DDHHS Renal Services team awarded a Queensland Health and Department of Health Excellence award. Pictured (from left): Dr Vinod Kelgi, Dr Sree Krishna Venuthurupalli, Dr Usman Mahmood, Ms Andrea Rolfe, Mr John Fanning and QH Director General, Michael Walsh. An innovative program designed to save renal patients hundreds of hours in travel time has been recognised at the 2017 Health Excellence Awards. Reduce MILES - Spread SMILES from Renal Services, Darling Downs Hospital and Health Service (DDHHS), saves rural and remote renal patient’s unnecessary travel through the use of telehealth technology. Starting with only 10 patients from the Kingaroy Clinic in September 2011, 25% of all chronic kidney disease (CKD) patients are now seen via telehealth, cutting out 100,000km of travel for many critically ill Queenslanders. All patients are seen at the Toowoomba Hospital for their initial appointment and are then offered a choice of a telehealth clinic from their local Queensland Health care facility. Senior Staff Specialist in Nephrology, Dr. Sree Krishna Venuthurupalli and his team at Toowoomba Hospital lead the project. Dr. Venuthurupalli reinforced the importance of team collaboration across the HHS, acknowledging it as being the foundation of success achieved by the program. 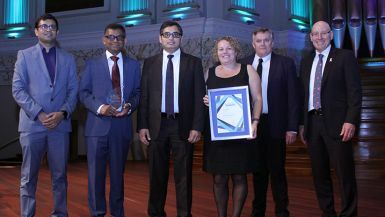 Dr. Venuthurupalli said he and his team were thrilled to get a nod at the 2017 Queensland Health Excellence Awards. **Reduce MILES, Spread SMILES was awarded best in the state at the 2017 Queensland Health and Department of Health Awards for Excellence.